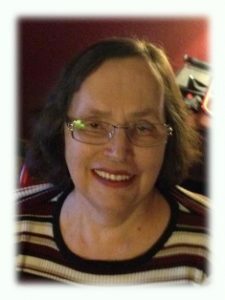 Kathleen A. Stelling, 66, of Whitefish Road in Port Washington, Wisconsin died Sunday, November 18, 2018 at Aurora Medical Center in Grafton, Wisconsin. She was born November 21, 1951 in Tomahawk, Wisconsin to Roy V. and Hattie M. Stump Larsen. She attended Rib Lake, Wisconsin area schools and the Medical Institute of Minnesota. She married John Stelling of Rib Lake, Wisconsin on June 27, 1970 in Millbank, South Dakota. Kathy worked in the medical field for various hospitals and raised her family. She was a caring and giving woman who liked to help and take care of others. She enjoyed being with her family and friends, reading, travel and wintering in Arizona. She is survived by her husband John Stelling, daughters Angela Stelling, Ann Stelling, Arin (Charles) Isaacon and Amy Becker; grandchildren Devon Stelling, Dylan Stelling Kordash and Carley Isaacson; 3 great grandchildren Hunter, Hattie and Aiden and a sister Darlene Unick. She is preceded in death by her granddaughter Cheyanne Isaacson. Funeral Services 2PM Saturday, November 24, 2018 at Vineyard Community Church, 1597 County Highway V, Grafton. Pastor Patrick Mulcahy will preside. Visitation will be 12:30PM-2PM Saturday prior to the service AT CHURCH. Previous Post: Anderson, Veronica L.
Next Post: Kolbach, Margaret P.
My deepest sympathy with the loss of Kathy.Somehow I did not get the sad news until now but I want to express my thoughts and impressions of how a gentle and caring person Kathy was.I would also like to give my admiration to her beloved husband and my friend John ,who was such a devoted and loving caregiver in every way to his wonderful wife.May God take Kathy into his loving arms as she deserves and cast Blessings of Love and Peace to John and Kathy’s entire family who cared for her through the good years and those of medical challenge.